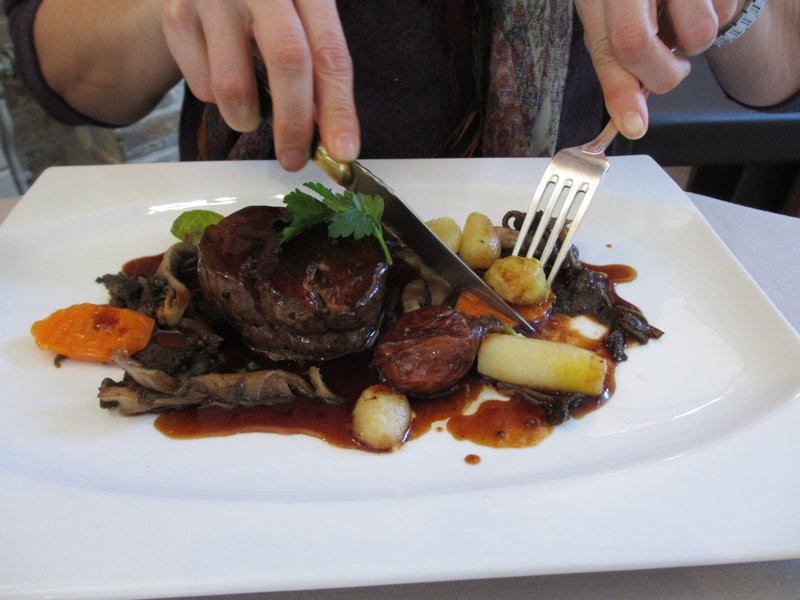 Don’t call it just beef: At La Chaumière in rural France, everything turns into a very French treat. I’ve been out of Paris over the week-end, we’ve visited a dog breeder’s farm in the Sologne region to find us a new flat coated retriever but our short trip happened to turn into a culinary excursion, too. We roamed close to Aubigny-sur-Nère, that’s very close to the banks of the Loire, so close, in fact, that we had to fight some inundations on the way. 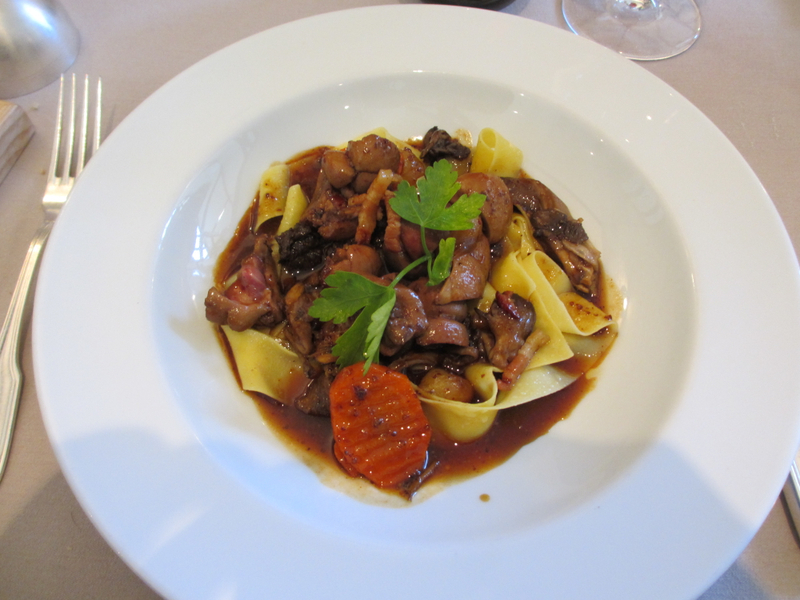 Rustic pleasures: veal’s kidney’s. You’ll never get there? Then dream with me. You’re running on goat cheese here, basically. The famous Crottin de Chavignol is a local as are the great wines of Saumur, Chinon, Sancerre, and quite a lot of others. At the tiny medieval village of Aubigny you’ll stumble upon La Chaumière, a hotel restaurant in the middle of nowhere, in the centre of France that is but pretty close to the perfect, simple dining experience we are all looking for. Well, you don’t stumble upon. You use your Michelin guide, what else? 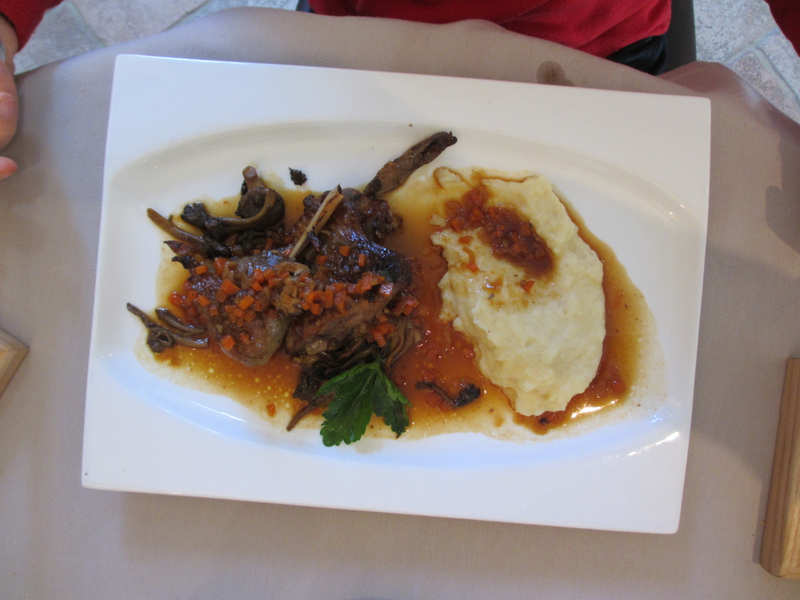 La Chaumière, where we had a satisfying, pretty bourgeois Saturday lunch, serves the best of what you know from your beloved cookbooks entitled “Rustic French Cuisine” or “Real French Cooking” or alike. We had eel and veal’s kidneys and beef and guinea fowl, accompanied by brilliant celery purées, vegetable stews, green lentils, thick sauces, demi-glace-stuff, excellent bread. Five excellent courses – cheese, everything – for 40 Euros, call it cheap. Ok, the desserts were, well, quite bland. But the overall experience, with the chef himself taking the orders and playing the nice guy, the beautiful wine from the region, the provincial yet cozy feeling of a dining room filled with quite a few people just having lunch, just enjoying life – here’s why I love France, and why we all do. 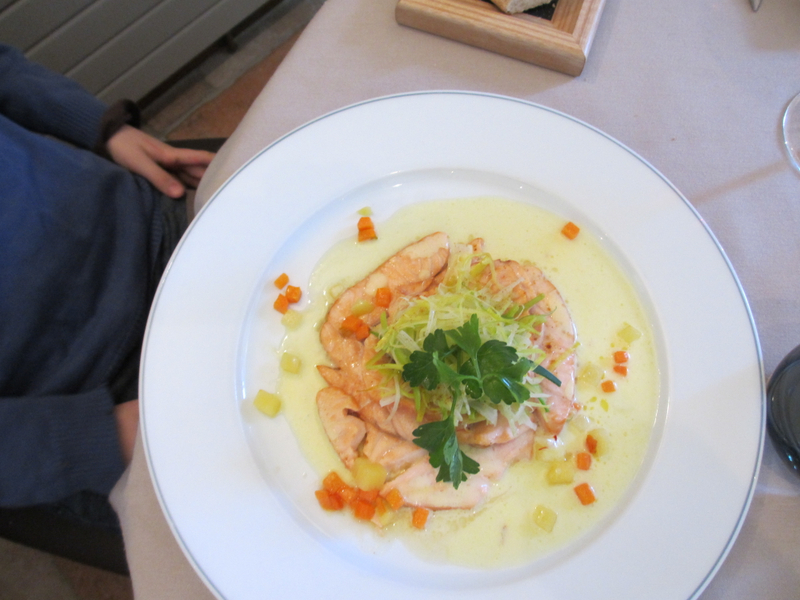 Salmon with a twist: At “La Chaumiére” you learn why France is a very special country. I happen to have some family in Sologne and I sometimes go there… I must remember the name of this restaurant. The food looks excellent and the price is more than attractive! Thank you for the recommendation. I really recommend visiting the resto, you won’t regret it, it’s like a 4-hour holiday, a cozy getaway.